The British left India as a divided nation, nursing the wound of partition and birth of Pakistan on August 14, 1947. A communal carnage continued for months and the macabre consumed thousands of life after the two nations won their independence. The scar of 1947 remains raw till date, bleeding time and again, making the two countries fierce rivals. Peace between India and Pakistan has been stubbornly elusive and political efforts to bring about change are the most boring soap opera you will ever come across. People on both sides of the border want to break out of the straitjacket of stated political positions and embrace one another. 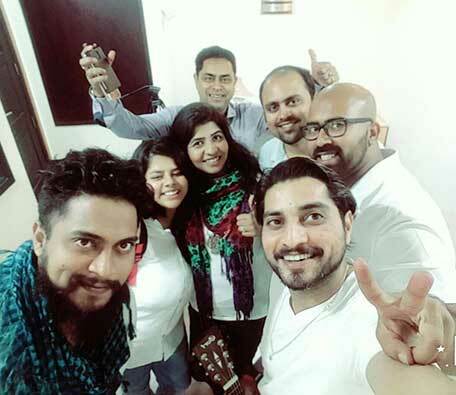 Hoping for peace, a group of musician from India and Pakistan living in the UAE, struck the right note as their country celebrates 70th Independence Day. What started over a cup of tea in a cafe, transformed into a brilliant musical collaboration. 'Amna Ki Asha' was a thought that germinated in DJ Desiree Francis' desire to bring people closer. Talking to Emirates 24|7 Desiree said, "When people actually meet, become friends, perception changes - this, I have come to know from experience And this idea is the germ of 'Aman ki Asha'. "The song of peace had struck me when I used to sit in Country Bakes cafe in Karama and sing as a stress buster." "Many would sit around, listening or even join in a jamming session. I ended up making friends, who didn't know I was a Pakistani. They would be taken aback when I would tell which country I belonged to. But then, nothing changed and we would still sing and still hold our sessions. "That is when I thought, 'If only we do not let our preconceived ideas take control over us, people from Paksitan and India can be friends. And we have a real chance to peace'." Desiree, who is a journalist and radio presenter, planted the idea to her musical brethren. Several vocal artists and musicians joined in to produce 'Amna ki Asha'. The group came together spontaneously and voluntarily to produce a song which they wanted to be more than just a web viral. Our campaign got a boast with the positive response DJ Dez Show received of various social media networking sites. Kyun kar dia mere aman ka tamasha"
Not willing to let the politians and history make a mockery of peace that people of both the countries so desperately want Desiree says, "There's too much negativity around us, too much hatred over hearsay. But we are not losing hope for peace and not going to let the hatred take over the love." The theory behind this song is to touch hearts, to bring something to life together as Pakistanis and Indians and build something and introduce the germ of love for peace. Desiree says, "If our effort can bring about change in one or two person, all this will be worth it." All the artists came together and provided their services free of cost for the cause.